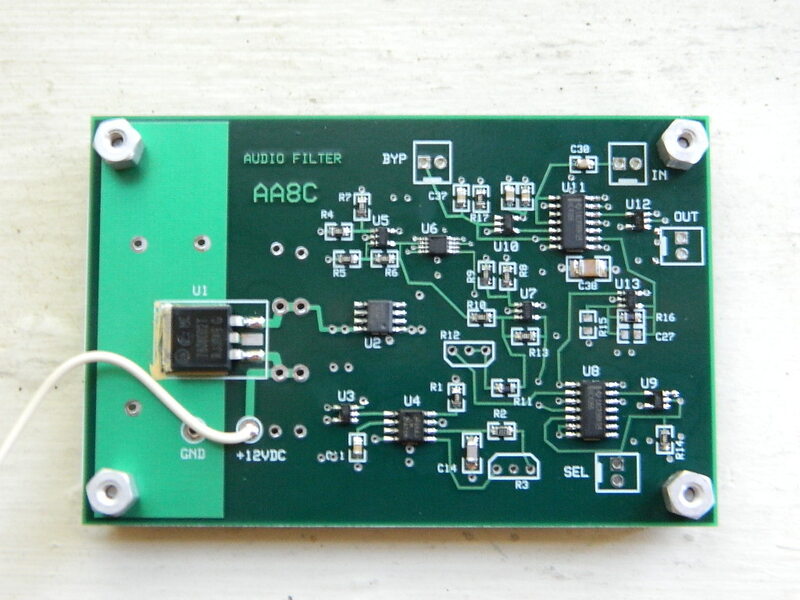 Here is a rather nice audio filter for use with Ham Radio gear. It features switchable operation as a -32 dB per octave low pass or notch filter having a 200Hz-2500Hz tunable cutoff frequency, buffered input and output, switch selectable filter bypass function, and good stability. Two of these boards can be cascaded for “brick-wall” filtering at better than -60 dB per octave response with a slight increase in noise output. The construction is surface mount technology. For those who wish to build this project using through hole components, all of the parts except the LMV931 opamp are available in through hole equivalents. Suitable opamps for through hole technology should be 5V rail to rail I/O type. The filter consists of a Maxim MAX7410 fifth-order, Butterworth response, switched capacitor low pass filter. Users wishing to use this filter with digital modes may want to use the MAX7409 Bessel filter which will offer fewer problems with phase shift , with a slight tradeoff in passband flatness. The filter is clocked with the output of an LM567 at frequencies between approximately 20 KHz and 250 KHz. Adjustment of the clock is achieved by means of a 20K , 10 turn, high stability wire-wound potentiometer. Provision has been made for a -30 dB notch filter by means of an inverting summing amplifier (U7) that sums the output with the input of the filter at the appropriate phase shift for the cutoff frequency. A 23 turn high stability trimpot provides an amplitude balance adjustment which defines the depth of the notch at the cutoff frequency. The two 74HC4066 quad analog switches provide for the ability to switch the filter from low pass to notch filter modes, and the ability to bypass the filter entirely. Use toggle switches to ground/open the SEL and BYP switch inputs. The clock output of the LM567 is buffered by means of a Schmitt trigger. The select lines used to control the filter mode and bypass functions are conditioned with Schmitt trigger inverting buffers, each having a 4.99K pullup resistor to +5V, and a 0.1 uF bypass capacitor to ground, on the input, to provide some RF immunity, as well as reasonably glitch-free switching when using toggle switches to ground/open the SEL and BYP switch select inputs. The filter input and output are buffered with National Semiconductor LMV931 5V rail-to rail I/O operational amplifiers at unity gain. Internally, the filter and buffers are fully dc-coupled with a +2.5V DC offset. Blocking capacitors at the input and output are present to avoid damage to sensitive circuitry due to external incompatibility with regard to dc offset. The maximum recommended input signal amplitude is 4.5V P-P. The absolute maximum input is 5.0V P-P. The input impedance is 10K ohm, and should be driven from a low impedance source. The output dc blocking capacitor was chosen for a load impedance in excess of 10K ohms, but lower impedance loads may be driven with minor loss in low frequency response. I found the noise output of the filter to be about 2 mV. I found the clock feedthrough to be sufficiently low to be difficult to resolve (in the noise), but according to Maxim, it may be higher in some cases. In any case, there is some noise output, and using the filter on signals smaller than a few millivolts will result in a poor signal to noise ratio at the output. In my application I installed the filter between the AF preamp and the AF power amplifier stage of my radio, right before the volume control to assure plenty of input signal amplitude and have had good results. If high stability 0.1%, metal film resistors are used for the dc offset voltage dividers, the clock oscillator, and the opamp gain setting resistors excellent precision and stability can be had. These cost about $1 each. Using less expensive 1% resistors was found to work, but a slight drift in the cutoff frequency of the low pass and notch filters was noticeable in just a few minutes. Using 1% resistors also resulted in a slight drift in the depth of the notch filter after a few minutes. One critical item is the 10K trimpot at R12 in the summing amplifier circuitry. This component needs to be highly stable in order to get the best amplitude stability in the notch filter. A Vishay foil trimmer potentiometer was used. These are quite expensive (@ $25 each), but are the only trimmer potentiometer found that was stable enough to avoid significant drift in the notch filter output amplitude, and small enough to fit on a circuit board. Also, resistors R8, R9, R10, R13 should be 0.1% metal film resistors. The 2200 pF capacitor used at C14 in the LM567 clock oscillator is a critical item. It should be type NPO, 1% tolerance. Use the part specified in the parts list because it is not only quite stable, it is a nice shade of lavender in color, and the ladies will just love it. The 20 K, 10 turn potentiometer used for adjusting the cutoff frequency is rated for 20 ppm stability per degree Celsius. It costs about $12. Be sure to read the specs of the potentiometer that you intend to buy as there are some rather expensive ones that are not very stable and will cause excessive amounts of clock drift. The filter was intended to operate from a clean, well-regulated 13.8VDC power source. The filter circuitry operates on 5VDC provided by an 78L05 linear voltage regulator and requires about 20 mA. The ability of the 78L05 to dissipate heat is limited, so the 13.8VDC source was reduced to 8VDC with an 7808 voltage regulator to reduce the power dissipated by the 78L05. An additional benefit of using two-stage regulation is improved power supply noise rejection. In this configuration the recommended power supply is 13.8VDC nominal at less than 30 mA, 11VDC minimum, 18VDC maximum. 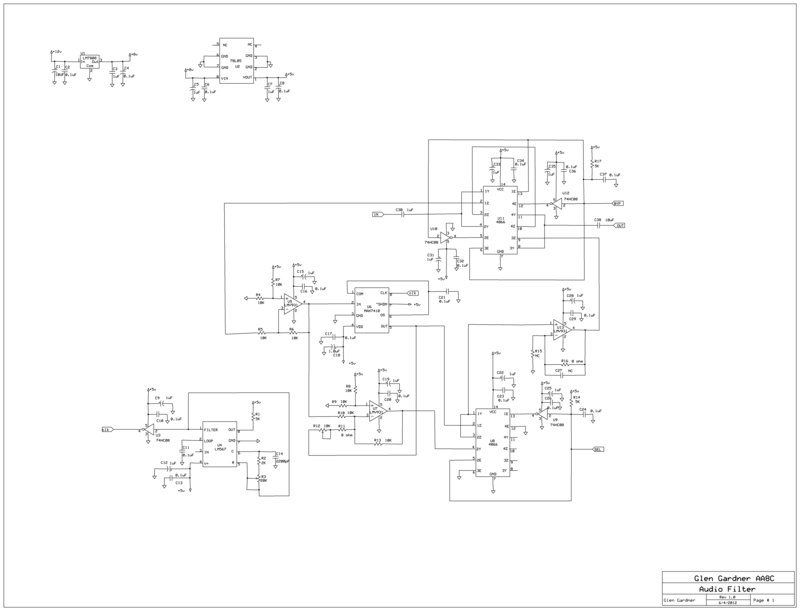 The schematic and board layout were rendered using the free software (expresspcb V 7.0.2) provided by expresspcb.com. The board is a 4 layer board and the provided filter2.pcb file is the completed board design file which can be used with the expresspcb software to order the board shown on this page. Click HERE to download the pcb file. The components used in this project were chosen to make the board relatively easy to assemble with simple tools. One exception may be U6, the low pass filter IC, which is in a very small 8 pin package that is easily soldered with hot air, or by solder dragging techniques, but some people might find it difficult to hand solder. Most people who are accustomed to surface mount technology won’t find this project to be a great challenge, but someone who is new to surface mount technology may wish to get assistance from someone who is experienced with it. I hand soldered the entire board with a low end Pace soldering station , using a 1/8 inch chisel tip and some extra heat to solder the heat sink of the 8V regulator, U1, and a long slender 1/16 inch chisel tip to solder the remaining components. A good pair of nonmagnetic tweezers, some 1/16 inch desoldering braid, liquid flux, and very fine gauge solder are suggested. Working under some form of optical magnification and good lighting are good ideas that will make construction easier. Before applying power, preset the 10K trimmer resistor, R12, to 5.0K ohms. 1) Apply 13.8VDC power to the board and observe that the idle current demand should be around 20 mA. Correct any problems before continuing! 2) Check the 5V output at pin 1 of U2, the 5VDC regulator. Correct any problems before continuing! 3) After completing the initial checks measure the DC offset voltage at Pin 4 of U13. It should be 2.5VDC. 4) Check the DC offset voltage at pin 4 of U7. It should be 2.5VDC. 5) Check the DC offset voltage at pin 4 of U5. It should be 2.5VDC. 6) Check the DC voltage at pin 5 of U6. It should be 2.5VDC. 7) Using an oscilloscope, check the clock signal at pin 4 of U3. It should be a clean square wave, 5V p-p, adjustable between approximately 20 Khz and 250KHz, by adjusting R3. Correct any problems before proceeding further. If all tests have been passed, continue forward to adjust the notch filter. For proper operation of the notch filter, R12 must be adjusted. 1) Initially, set R12 to a value of 5K ohm. 2) Apply 12VDC power to the board. Current demand should be around 20 mA with no input. 3) Make sure the BYP switch and SEL switches are OFF (the filter is enabled and notch is selected). 4) Apply a 1KHz, 1V p-p audio signal to the filter input and observe the output waveform on an oscilloscope. 5) Rotate R3, SLOWLY for minimum output of the 1KHz signal (the tuning can be very sharp). 6) Adjust R12 for minimum signal output. 7) Carefully readjust R3 then adjust R12 again for minimum amplitude of the signal output. 8) After adjustment, the depth of the notch should be around 30 decibels. NOTE: If R12 is set to an extreme value the dc offset of U7 may “go to the rail” causing the output to be clipped. I built my filter into a nice tight-fitting metal enclosure. I installed two filter boards and can use them independently , or both at the same time. I also added a 1K precision single turn potentiometer (not shown in the schematic) in series with the 20K 10-turn pot so that I could easily fine tune the notch filter. In practice the fine adjustment proved to be useful, but not essential, and not really worth the extra cost. I used BNC jacks for the input and output for each filter. I used a short BNC jumper (not shown) to connect the filters in series so that I can use one as a low pass filter and the other as a notch filter at the same time. I added a toggle switch for turning the unit on and off, and a chassis mounted power pole connector to deliver 12VDC to the unit. You really want to build this filter in a nice tight-fitting metal box. The clock oscillator does generate rich harmonics and an unshielded enclosure can result in strange “birdies” appearing in your receiver from time to time. I built two of these filters into a single enclosure that I bought from TenTec">TenTec and am quite happy with the results (no birdies). Keep the leads to R3 short, and twist the wires together gently to keep things neat and to help reduce unwanted emissions. Mount the board on metal standoffs to provide an electrical connection between the foil pads at the mounting holes of the board and the metal chassis. Do not use lock washers as they will tear the copper foil on the board. The holes in the board are sized for #4 hardware. You may wish to consider using a turns counting dial that has a lock on the 10 turn potentiometer, R3. Slight changes in the mechanical parts due to minor vibration and temperature changes will sometimes cause the notch filter to shift a little when the dial is not locked. This is not a huge problem, but some people might find it sufficiently annoying that they may prefer to use a lock on the dial. Use SPST switches to connect to the BYP and SEL inputs. These switches will be used to select the filter functions. Twisting the wires gently reduces the effects of stray noise and makes for a neater appearance inside the chassis. To use the low pass filter, set the BYP switch to OFF, and set the SEL switch to ON. Adjust R3 to set the cutoff frequency as desired. To use the notch filter, set the BYP switch to OFF and set the SEL switch to OFF. SLOWLY adjust R3 as the notch filter is quite narrow and it is easy to tune right past the null if you adjust R3 too quickly. On a keyed CW signal it is easy to tell if you have the notch filter adjusted as the key clicks from the CW signal will suddenly become faintly audible when the notch approaches being perfectly centered on the signal. The passband gain of the notch filter is slightly higher at frequencies below the notch center frequency, than at frequencies above the notch center frequency. To bypass the filter, set the BYP switch to ON. 1) Layout a low cost two layer board, and switch to 0603 size for most of the surface mount resistors and capacitors. They are less easy for a newbie to work with than size 805, but are a lot cheaper. 2) Use inexpensive, generic 1% resistors. It will drift a little more more over time, and the depth of the notch filter will be a little less, but will still work well. 3) Replace R12 with a generic 10 turn trimmer potentiometer. Alternatively, you can replace the trimpot with a fixed resistor value close to 4.930K ohms. 4) DO use a good 10 turn potentiometer at R3. A single turn potentiometer is going to be nearly impossible to use with the notch filter. A cheap carbon pot with a reduction drive simply is not going to do the job. The part specified in the parts list for R3 is actually one of the cheaper models and works nicely. 5) DO use a good NPO capacitor for C14. You can use mica or polystyrene capacitors here and they will typically be more stable than the NPO cap, but are really large. 6) Skip using the fancy counting dial for the 10 turn pot. The parts used to build this board are listed below. All parts , except R3 and R12 are surface mount technology. C27 and R15 are not populated in this design.